The 24 Inch Style Bike is one beautiful bicycle. Whether you’re racing around the block or cycling to the park with friends, you’re sure to ride in style with this bike’s pretty pinks and elegant frame. The stylish and practical 24 Inch Style Bike has 6 speed gears, allowing you to cycle with the power that best suits your environment. Find the perfect gear for your path to make cycling effortless. Cycle uphill in low gear, ride on everyday terrain in a middle gear and switch to higher gears to ravel further with each push on the pedal as you descend or accelerate. The Shimano derailleur of the 24 Inch Style Bike makes changing gears smooth and effective. 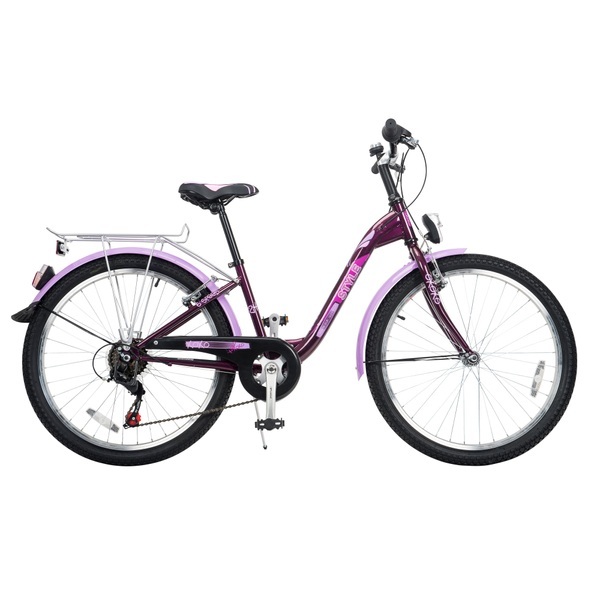 The 24 Inch Style Bike features a steel frame that’s engineered for strength and durability. The comfortable saddle of this striking bike features a sporty print in black, pink and white. Contrasting light pink mudguards protect the rider from splashes while cycling, while the bell and front and rear lights make sure that the cyclst can be seen and heard while out and about. The alloy V-brakes operate with a direct-pull mechanism for instant braking action. A rear steel carrier, alloy rims with air pumped tyres and a convenient kickstand complete the design of the strong and pretty 24 Inch Style Bike.